Today it is so dark, you can leave the lights on all day long. So I decided to spice up my tea lights by making these lamps. It's a bit time-consuming to do them because between the different steps you have to allow for the several layers to dry. As there is wax involved it is not advisable to use a blow-dryer to shorten the process. Measure the circumference of your tea light holder and add 1cm for comfort plus 1 cm per side to overlap. 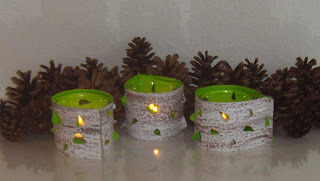 Fix the paper to your work surface with masking tape and rub it thoroughly with your candle. Apply a coat of watercolour and let dry. Fix the colour with diluted glue, taking care not to smear the watercolours. Or use acrylic paint so you can leave out his step. Let dry. After drying, cut in appropriate strips. 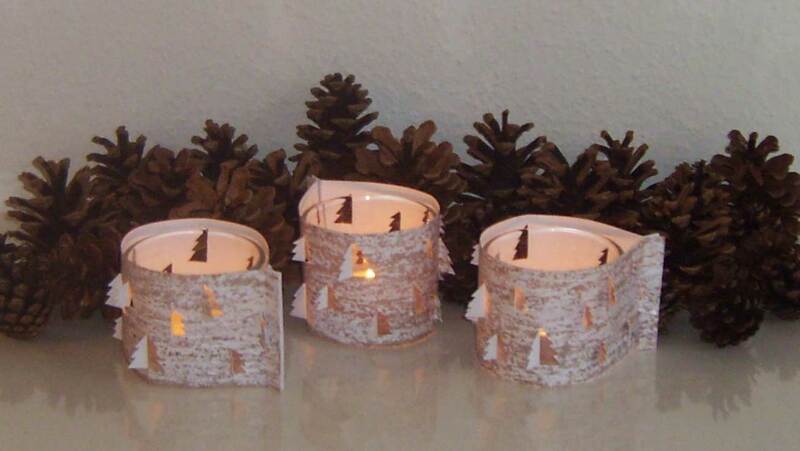 Prepare two templates of a fir tree in different sizes and cut the contours into the paper strips. Take care only to cut one half of it lengthwise. Carefully fold back the trees along the edge of a ruler so there will be small wholes to let the light shine through. Now the tree halves add up to a hole tree. Fold the short sides 1 cm from the edge. To close the circle cut one tree exactly in the middle with its center in line with the fold. Also cut a bit from the tree top down- and from its base upwards, leaving about a third of the length uncut. On the opposite fold cut a rectangle about 2 mm longer than this uncut piece and 1 to 2 mm wide. Turn down the 'flaps' of the tree and pull gently through the rectangular slit. Unfold the tree. When making these lights, it occurred to me that they resemble the bark of birch trees. So I made another set, where the colours are even closer to the original, glued some spring green tissue paper on the inside and cut birch leaves instead of fir trees. These go even better with the spring like temperatures outside. Plus they will make you forget about the darkness and the soggy wheather.